Various labels imprinted by the Total Library Labeler. 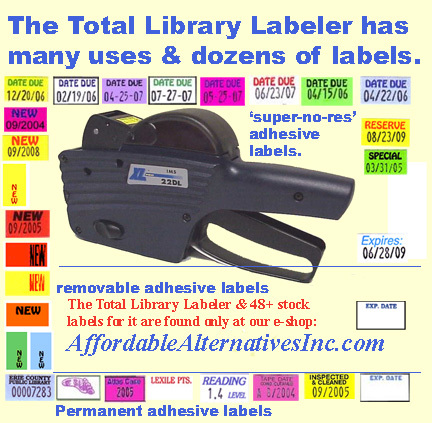 <--->Click on this Total Library Labeler to see some of the imprinted labels it will use to assist with over 20 routine library tasks. You'll find over 48 labels to support these tasks. It has 8 number bands 0-9, the middle six also have a slash, , & dot. Band #1 has a $, & band #8 has a ¢ sign. This enables you to use it with labels on this page & other pages in this e-shop. Click on Loading Instructions in the header of any page for loading instructions for any XLPro or TXM labeler.